PHILADELPHIA (September 11, 2014) — The public will have the chance to meet members of the team that discovered a recently unveiled 65-ton supermassive dinosaur and see some of its fossils for one day only at Dreadnoughtus Day, Saturday, Sept. 20, at the Academy of Natural Sciences of Drexel University. On hand will be Drexel University paleontologist Kenneth Lacovara, PhD, an associate professor in the College of Arts and Sciences, who led the team that discovered Dreadnoughtus schrani, and Academy Dinosaur Hall Manager and paleoartist Jason Poole, who was on the team that unearthed the exceptionally complete skeleton of the sauropod dinosaur in Argentina between 2005 and 2009. Lacovara will give an illustrated presentation about the discovery at 11 a.m. and will be available to talk with museum visitors. 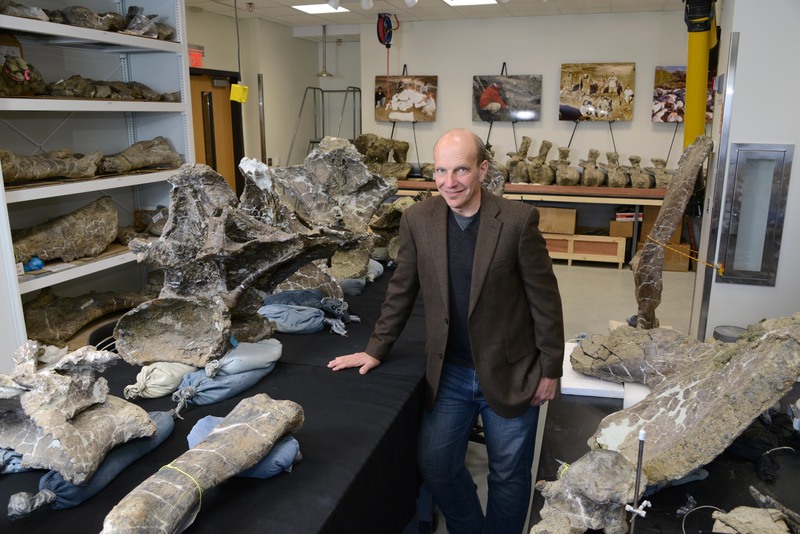 Poole will give a presentation at 2:30 p.m. and discuss how some of the Dreadnoughtus fossils were prepared for study in the Fossil Prep Lab in Dinosaur Hall. He also will be on hand to answer questions. Several fossils from the massive plant-eater will be on view at the Science Live area throughout the day. Visitors will be able to touch real fossils, do experiments, and more to learn about sauropods, titanosaurs and how paleontologists find fossils. Dreadnoughtus Day is free with regular museum admission. On Saturday, Sept. 20, the museum will be open from 10 a.m. to 5 p.m.
Dreadnoughtus schrani is the most complete skeleton of its type ever found. At 85 feet long and weighing about 65 tons in life, the dinosaur is the largest land animal for which a body mass can be accurately calculated. Its skeleton is exceptionally complete, with over 70 percent of the bones, excluding the head, represented. Because all previously discovered supermassive dinosaurs are known only from relatively fragmentary remains, Dreadnoughtus offers an unprecedented window into the anatomy and biomechanics of the largest animals to ever walk the Earth. Lacovara and colleagues published the detailed description of their discovery Sept. 4 in the journal Scientific Reports from the Nature Publishing Group. For more information about Dreadnoughtus schrani, visit http://drexe.lu/dreadnoughtus.